Tax Justice Network: How many banks, accountants, lawyers in tax havens? 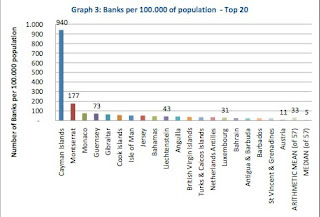 How many banks, accountants, lawyers in tax havens? TJN's Mapping the Faultlines project has produced a new analysis based on the data it has collected, looking at how many banks, accountants and lawyers are present in secrecy jurisdictions (tax havens) around the world. It is the fourth such report in the series so far. services and, by interaction and collusion, have the knowledge and means to handle and hide illicit financial flows if they so wish. Second, banks, lawyers and accountants active in financial services will have considerable power in any secrecy jurisdiction that is heavily dependent upon financial services. And if bankers, lawyers and accountants are present in high numbers a culture of constructive non-compliance can be created. In effect this means that the appearance of compliance is present but the rate of reporting of potential money laundering offences is low in proportion to the likely risk that they occur." As the reports, by way of example, only a tiny number of suspicious transaction reports were filed in places like Jersey and Guernsey, relative to the number of depositors. Read on.